The latest version of the Pro Bikegear Vibe Stem has clever designed internal channels for routing the cables of Shimano DI2 integration. The Vibe Stem from Pro Bikegear has been the preferred stem on the Pinarello Dogma K10 bikes from Team Sky in the Tour de France 2017. Pro Bikegear is one of the few manufacturers who build stems for the 1.25 inch steerer-tubes that are found on Canyon and Giant road-bikes. I have been riding a Ritchey WCS 4-AXIS 44 stem with a Ritchey WCS Evocruve handle bars with a compact drop on my Canyon Ultimate CF SLX. I purchased the Vibe Stem from PRO Bikegear because it fits 1.25 steerer-tube of my Canyon and they offered the length and angle I needed to get my new position(fit) dialed-in. The Vibe Stem is build from matt anodized AL-7075 aluminum with glossy pro and vibe branding. 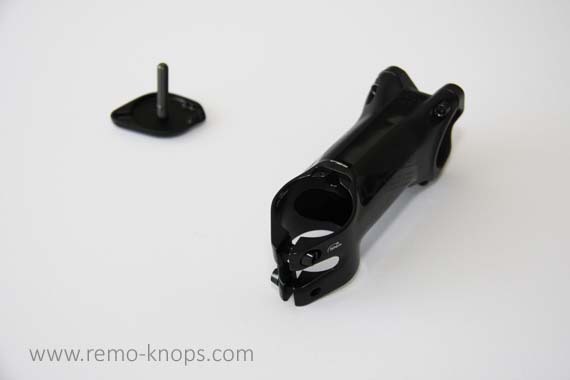 The stem has a diamond shaped cross section which makes is a very stiff stem, with noticeable difference compared to the Ritchey WCS 4-AXIS stem. The weight of the stem is about 125 grams, without the specific Pro Vibe topcap. The Pro Vibe stem comes with black titanium bolts to keep the weight low (while maintaining the required strength for a bolt). Normally the bolt-heads are at the side of the stem front-plate. Basically you are screwing the front-plate onto the stem, and thus clamping the handlebar. The Pro Vibe stem works in a reverse order, where the bolt-heads are on the stem-side and pulling the front-plate against the handlebar and stem. The clamping bolt are also positioned in a slight angle, and the front-plate looks very clean and tidy. Possibly it also gains some aerodynamic advantage. From a design and engineering perspective the handlebar clamping is a unique design feature. 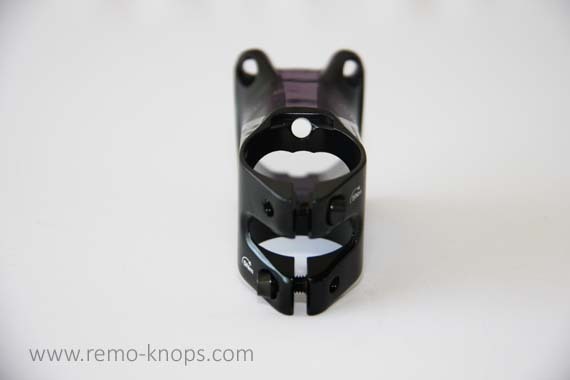 Another design feature is the drop-shaped steerer-tube clamp. The specific top-cap has the same shape making this a clean and eye-catching detail. The top-cap is manufactured from aluminum and comes with again a black titanium bolt. The new Pro Vibe stem has been developed in collaboration with World Tour teams Sky and FDJ, who race with Shimano Dura Ace R9100 DI2 group sets. 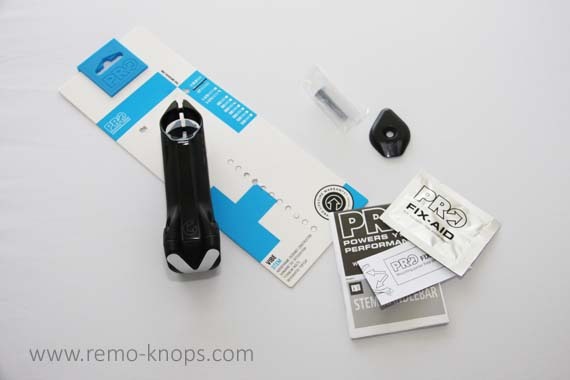 As you can see in the picture above the Pro Vibe stem has a dedicated cable port, and so do the Pro Vibe handlebars as you can see in the PRO Vibe Assembly Instruction. This is a very useful instruction with practical tips on how to route Shimano DI2 cables through the Vibe handlebars and stem. I’ve seen some very clean looking setups in the Tour de France 2017, where the Vibe Stem is combined with the Vibe Aero handle bar. Check out the setup of Christian Knees with a new K-Edge Garmin computer mount for the Pro Vibe stem. I’m very happy with the Vibe stem from Pro Bikegear after three months of use. It is indeed stiff and very robust. I still use the Vibe stem with the Ritchey WCS Evocruve handlebar but love the clean “Christian Knees setup” with the Vibe Aero handlebar. I would love to know how clean that looks when you are running a Dura Ace mechanical group set. I got the Pro Bikegear Vibe stem for a price point of € 85,00 from www.bike24.com. 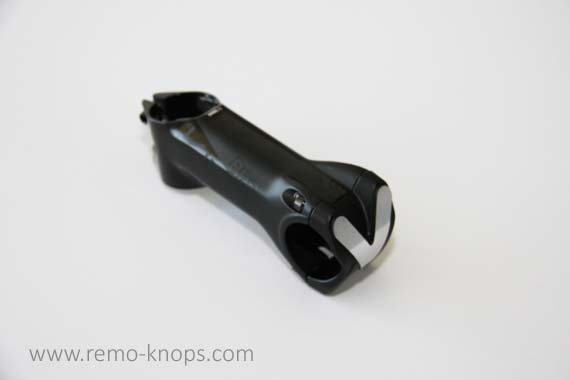 It is not very expensive given that the top cap and titanium bolts are included, and when you are riding a road bike with a Shimano DI2 group set this stem is the way to go. You will get a lot of engineering value and quality with the Vibe stem from Pro Bikegear. Interested in other product reviews of cycling products, please check out the cycling review table. The original M6 x 35 mm. bolt was to long to fit with my headset expander plug. I’ve modified the current bolt to a length of 30 mm. Good news is that I could order a spare one at Tuning Pedals, where I also ordered some titanium bolts for the Tune Wassertrager Carbon bottle cages. Hey!, I found this information for you: "Vibe Stem with Shimano DI2 integration from PRO Bikegear". Here is the website link: https://www.remo-knops.com/6953/vibe-stem-shimano-di2-pro-bikegear/. Thank you.